We don’t have sufficient information to reset your security questions. If you are having this problem too, this article explains how you can troubleshoot. This problem can be very frustrating as you may be prevented from buying apps etc until you can answer your security questions correctly. If you cannot remember, you can reset (see below). The first thing I should mention is that you need to verify your identity successfully before you can reset your security questions. Apple takes security very seriously, as any reputable company should. Apple uses security questions as an authenticator to provide an extra security layer, so that your information is secure. See also: Can I Unlock My Device From a Previous Owner’s Apple ID? You will be asked some questions to verify your identity. Apple wants to make sure that it is really you. Then you will be presented with various help options. Note that these help options may vary depends on your region. Note that if you do not remember your answers, and if Apple team may authenticate your identity (they will ask you several questions), they may not be able to help you. Because they also may not access your account. They may offer you a new Apple ID but note that you will lose all your past purchases. If you do not want to deal with this problem again, you may want to set up two-step verification or two-factor authentication. Nope! This is wrong. If you forgot your security questions and you don’t have a rescue email you are pretty much out of luck and will lose your account! 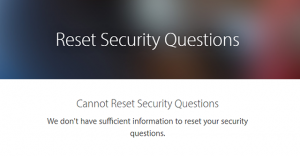 Even Apple Care support is asking you to answer security questions to reset them! Wherever you have full details of the account or not. They are just not willing to help! So don’t forget them or you lose the account. That’s the bottom line! This is true from my experience. This is true. Apple will not help! I have tried several times and despite telling them I have done this they still try to get me to repeat the same steps THAT DID NOT work before. I gave up and made a new account. HOWEVER, my old apple id was hacked and now I’m getting emails about it and apple REFUSES to help me! I got a new iPad, and was able to log in using ONLY two simple security questions, like my nickname and something. I did NOT have to type my Apple ID password! Everyone who knows me might know the answers to these security questions, and may then be able to set up iPads with MY account. Because of this, I changed the answers to something like “asdFA TRQ GDAfdsSDG 4” just to make sure no-one can guess them. Nope, I didn’t write down exactly what they were changed to. Now I’m unable to access my account. So, if you still plan to use Apple products: Remember your security question answers, and expect anyone who knows you from the past to get access to your account. I ran into this problem and spoke with Apple support. They helpfully said they would reset the security questions, but only if I could answer the security questions first. It’s a mess. I have the password, I have the email address. The only way to reset something I’ve forgotten is to know what I’ve forgotten. Apple just aren’t very good anymore – the ‘it just works’ philosophy is one of yesteryear. I’m not buying Apple products until they return to a quality that supports the price point. I am facing the same issue. I have the email address, I have the (verified) phone number, I have the phone, I know the password, but I forgot the answers to the security questions and hence I cannot log in to the account to accept the damn terms and conditions (without which I cannot use the account). When I contact Apple support, they are asking for the security questions again. Why would I contact them to reset something if I forgot it? Unfortunately, it happens to be my work ID, so I can’t just use another email address. My step daughter is locked out of her iPhone. The recovery e-mail address they have her isn’t hers and the security questions she’s asked she gives them her answers, but they say they’re wrong. She asked if she could get a new apple ID to use her phone and they said no. The phone needed a factor reset. Is the only way for this phone ever to be used again is knowing information that doesn’t exist? Is the phone completely useless at this point? Sorry, but thats annoying. i know the password and i know all my details and just wanted to login, Apple says verify the security questions. When i answer them, they say the answers are wrong, then i try to reset them, they say “We do not have sufficient information to reset your security questions.” How is this possible? thats insane ! what information you should have to allow me to rest the account properties (sec questions)? Same issue here. Back to a few months ago someone hacked my email account and create an Apple ID using it. When I found out I reset both the email and Apple ID’s password but cannot change the security questions of Apple ID. To my horror, the one who steals and creates Apple ID could still reset the password using the security question! Apple said the only thing I could do is to answer the security questions correctly. How am I supposed to know the answers to a thief?! Cannot believe that Apple is protecting the crime. Having the same experience. Wrote down the exact spelling of at least one security question. Both the answer as I wrote it down & the other possible variation of the spelling are not accepted. Keep in mind this exact same answer worked 15 months ago…. When I say the account must be compromised, the supervisor “helping” me scoffed at my statement. “It hasn’t been compromised”, she flat out says. This is *not* “taking security seriously”. Def. not the quality — or smarts — they once were known for. And I’ve been a fan since 1992 (or earlier), even through their near-demise, when everyone wondered why I was still buying Apple, since they were clearly soon going out of business…. I just knew they still “had it.” Now, serious doubts. 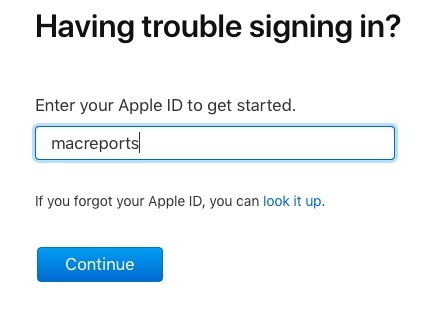 Same issue, but even worse: I have all my Apps under this apple id, and I cannot login as it asks for security questions. I try to switch on 2 factor login, cannot as it asks for security questions. Tried to reset them, but cannot it asks for security questions. Called support, they asked for security questions. So another apple id is no an option for me, because then I will lose my Apps as well. I forgot my security questions answers and phone number but I have a rescue email. How to unlock my apple ID? Same issue. I have also answered the questions correctly, with the potential spelling differences. I think once you get one answer wrong, they are both wrong moving forward. Even after 2-factor authentication, I cannot login without the security questions and cannot reset security questions even with 2-factor, proper ID, and proper password. Completely done. Apple the stupid company today! you cannot connect to your account without security qustions. Haaa haaa haa. blaa blaa bla. “We do not have sufficient information to reset your security question” – Apple your its normal? you have bank card, tel number, email and We do not have sufficient information to reset your security question??? what? Stupid security, Stupid apple security genius. we now not connecting to our business account. Perfect stupid Apple Service. Make new account, very good helping. And how-to we say all our client to the change apps in apple store? Apple stupid company! I can’t sign into my Apple ID because my phone number has changed. I was to get the two factor authentication code but I tried my current phone number and it’s not helping.